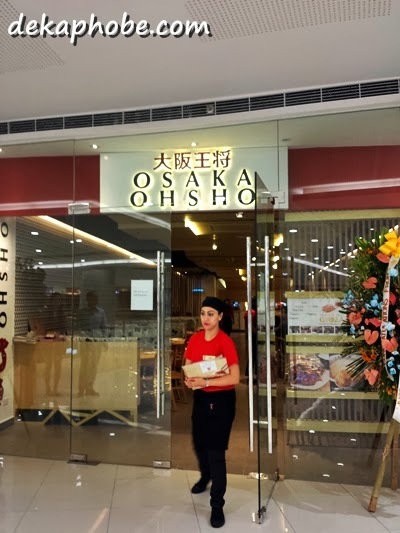 [i am a dekaphobic]: Osaka Ohsho, King of Gyoza: Now in Manila! Numerous Japanese restos have sprouted these past few years -- ramen, katsu, sushi restos. But one unique Japanese restaurant that has just opened specializes in gyoza or Japanese dumplings, Osaka Ohsho. Osaka Ohsho started from a humble gyoza stand in 1969 and now has 360 locations all over the world. Osaka Ohsho's Gyoza are handmade daily from the freshest ingredients. Flavors are Original (Php 175 for 6 pcs, Php 350 for 12 pcs), Cheese (Php 190 for 6 pcs, Php 380 for 12 pcs), and Nori (Php 190 for 6 pcs, Php 380 for 12 pcs). Although I have always loved the Original flavor, I fell in love with the Cheese flavor and surprisingly, I loved the Nori flavor as well. Honestly, you must try all flavors when you visit. A must-try dish by Osaka Ohsho is the Fuwatoro Tenshin Han (Php 310). Fuwatoro Tenshin Han is a Koshihikari rice dish topped with the fluffiest omelette I have ever tasted and gravy. A serving can be shared by two persons. Other delectable dishes include the Kushi Age Katsu Tower (Php 335) and Black Vinegar Chicken (Php 325). Also for sharing, the Kushi Age Katsu Tower has assorted meat and veggie katsu. The Black Vinegar Chicken is a savory dish both sweet and sour, this is a perfect pair to gyoza. We were also served Fresh Miso Soup (Php 70), Original Chahan (Php 240, good for two) and Crab Cream Croquettes (Php 225 for 2 pcs). We finished our awesome lunch with desserts. Osaka Ohsho has Homemade Japanese Ice Cream (Php 125 per scoop), Japanese Parfait with Homemade Japanese Ice Cream (Php 280) and Banana Tempura with Homemade Japanese Ice Cream (Php 330). You can also bring home Osaka Ohsho's gyoza either cooked or frozen in a special box with instructions on how to cook them. All Osaka Ohsho sets come with 3 pieces of gyoza, miso soup, a fruit plate and unlimited steamed Koshihikari rice. Everything is reasonably priced and the food is really delicious. I enjoyed this experience a lot that I can't wait to bring my friends and family here. Thanks to Osaka Ohsho Philippines for having us. Oh my! I want to visit this soon, good that it's near! Would love to try their cheese and nori gyoza... I love crabs so I want that croquette too! Hahaha! I'm thankful the cheese gyoza wasn't in front of me. Kung hindi, I could have eaten more than I should. hahaha.